John Isner of the US returns a shot on January 9, 2013. Isner and German fourth seed Tommy Haas advanced to a semi-final matchup at the $547,000 ATP SAP Open on Friday with straight-set triumphs. 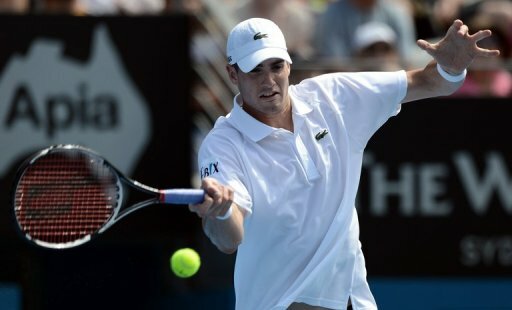 SAN JOSE, California (AFP): US second seed John Isner and German fourth seed Tommy Haas advanced to a semi-final matchup at the $547,000 ATP SAP Open on Friday with straight-set triumphs. Isner, ranked 16th, fired 10 aces, the last of them on the penultimate point, in defeating Belgian eighth seed Xavier Malisse 7-6 (10/8), 6-2 in a match that lasted just 68 minutes. World No. 22 Haas, who ousted US wild card Steve Johnson 6-4, 6-2, has lost three of four career meetings to Isner, who at 27 is seven years younger than Haas. Haas was last year’s ATP comeback player of the year after an injury-nagged 2011. But they have not faced each other since a second-round match at Cincinnati in 2009. In later quarter-finals, Canadian top seed Milos Raonic will face Uzbek sixth seed Denis Istomin and US third seed Sam Querrey will play Colombia’s Alejandro Falla.